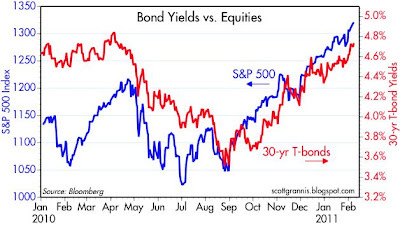 It's fascinating to watch bond yields and equities rise. Bond have been rising since the end of August, which also happened to be the time when the Fed first floated the idea of QE2. I've said before that if there was anything helpful about QE2, it would be that it effectively quashed the fears of deflation. Without deflation to worry about, the market's level of confidence in the future increased, and that in turn unleashed new jobs-creating investments. But I think there is more at work here than just the death of deflation. The politics of the electorate has undergone a huge shift; there was a major change in the balance of power in Washington; Congress is now debating how much to cut spending, not whether to raise taxes. Moreover, corporate profits have been strong for quite some time and continue to increase; business investment (capex) has been growing strongly for the past year; and businesses have undergone major adjustments in how they operate, with the result that costs have been slashed and the productivity of workers has been very high. So rather than laud QE2 for successfully boosting the economy, I think it makes more sense to recognize that natural forces of recovery have been building for a long time, well before QE2 was first floated. This is a genuine recovery, not a figment of Fed policy, and as such it has a lot more staying power than most skeptics imagine. It's also worth noting that two Fed governors (Fisher and Lacker) today expressed deep concerns about the wisdom of continuing the QE2 program, citing the economy's obvious improvement in recent months and the increased signs of impending inflation. 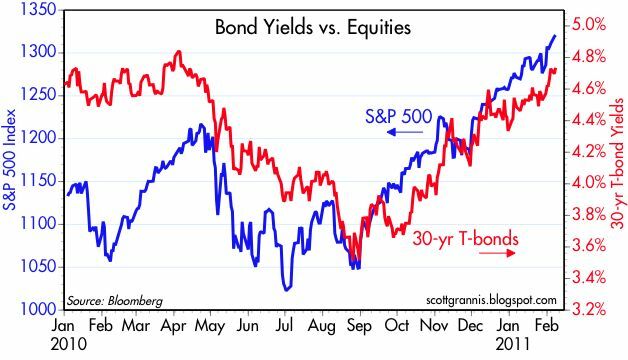 Stock prices and Treasury bond yields represent the collective wisdom of hundreds of millions of investors who control scores of trillions of dollars worth of assets. Prices and yields are rising because the outlook for the economy is improving daily. The Fed cannot ignore these powerful fundamental forces for much longer. What has happened to Benjamin? He has not been banned has he? His comments have always been more than interesting to read. Benjamin has certainly not been banned. We can also look at what happened in March and April of last year to drive up T-bond prices. The sovereign debt issues in Europe come immediately to mind. The summer slowdown is at least in part driven by fear of a second financial crisis originating in European banks. It is clear as you say that Bernanke's expressed determination to avoid deflation has eased deflation fears. Some people certainly believe that monetizing the federal debt is inflationary. I think these people are operating from an outdated paradigm but what they think matters. Another new reality is that the economy is driven increasingly by what happens in Washington. This makes the November elections highly significant - both before the fact in September and October and after the fact with the extension of the Bush tax cuts. They show a parallel to 1973 and 2007 equity collapse in regards to very strong CRB increase, it would be very interesting to compare other factors/indicators. Maybe this time is different. Re parallels to 1973: It is very tempting to draw parallels between now and the 1970s. Monetary policy is/was very easy; presidential leadership is/was dismal; commodity and gold prices are/were generally rising. But there are some important differences. Corporate profits were generally weak in the 1970s, averaging about 5% of GDP. Corporate profits are very strong today, about 8% of GDP. After decades of being the strongest currency in the world, the dollar suffered a massive, unexpected devaluation in the early 1970s that sent shock waves throughout the world. Today the dollar is very weak, but it hasn't plumbed new lows for decades. In the past decade, the emergence of China and India as giant and rapidly growing economies (and thus voracious consumers of commodities) is unprecedented. While commodity prices have surged in the past 10 years by the same order of magnitude as they did in the early 1970s, genuine demand could be playing a much more important role today in pushing prices higher. Finally, the CPI was much higher in the 1970s than it is today. Equities collapsed from 73 to 74, but the CPI rose from 3% to 12% over that same period. Today most measures of inflation are at very low levels. How will monetizing our debt not create runaway inflation? America thinks it has an unlimited credit card to get itself out of any "emergency". We will keep using it as the financial crises keep on coming. An alcoholic doesn't stop drinking until he hits rock bottom, and the U.S. and won't stop borrowing until we have to. I have a buddy that makes a good living. But he always has to borrow money to get from paycheck to paycheck. As long as people are willing to lend to him he keeps on going. As responsible citizens we can't let people like him be the financial model for how we run our country any more. Wish I could be as sanguine as you re the new House. They certainly have a mandate from the electorate but just today came up with a mere $38 B in spending cuts out of a $1.5 T budget. This, plus the wimpy tax deal they negotiated n December, does not bode well for fiscal restrant. The House is not going to be able to fix the budget in one day, one week, or even this year. I think it will require a lot of effort and take quite a bit of time. It's too early to conclude that reform efforts are going to fail. I agree it's too early to say the reform efforts will fail, but these early minuscule moves when the House Repubs are at the high point of their political power -- a wasting asset -- tell me they are going to go with symbolic incrementalism rather than serious budget cutting. I hope I'm wrong, but having spent a decade on the Hill I'm deeply worried. would you have said the same thing about the wisdom of crowds on the way down? Are not the majority here looking at only one side of a balance sheet? Does the country has massive assets? Does the country have a rather large and growing income side? As far a stock are concerned and the last couple of years, is not waiting for the dip the new wrong? Thanks Scott for this explanation.